West side school plays and musicals that resonante decades later. Recently, we looked back at several local individuals and groups who achieved some notable successes in the performing arts, but exactly what nurtured all that talent? 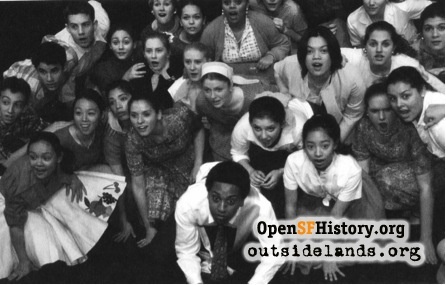 One might argue that attending San Francisco schools, either public or parochial, in the 1950s and 1960s, gave us all a taste of show business at an early age. My own acting debut was in December 1957 on stage at Parkside School. As part of the Christmas (a word still used in public schools back then) pageant, many of us kindergarteners were interspersed on stage among the big third—sixth graders in the cast. Our non-speaking roles involved holding/shaking flocked, glitter-encrusted cardboard snowflakes, thus setting the wintertime scene. We felt quite smug and superior to the first and second graders who formed the chorus, and who were relegated to sitting on the floor, singing endless choruses of Jingle Bells and Rudolph the Red-Nosed Reindeer. To hear the teachers, Mrs. McAtee, Mrs. Beckerman, and Mrs. Ehrmann discussing our roles, we just KNEW that the silent snowflakes were the show’s highlight. Then it was off to St. Cecilia’s, where there was a similar emphasis on stage productions and dance recitals. As first graders, we formed a chorus, singing harmony to Row, Row, Row Your Boat. Advancing to second grade, we performed the Mexican Hat Dance, with the girls all wearing colorful skirts and the boys wearing matching striped serapes over one shoulder as we displayed the dance that Mrs. Hunter had taught us. 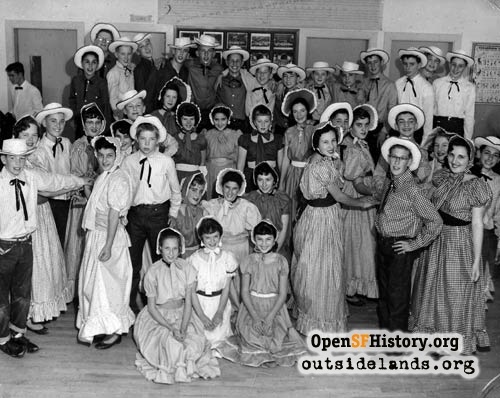 Among the more memorable presentations was a 1961 production involving my fourth grade class, with a nineteenth century schoolroom background, singing vintage hits such as School Days, Oh Susanna!, Camptown Races, Old Folks at Home, Jeannie with the Light Brown Hair, and Beautiful Dreamer. Thanks to the support of behind-the-scenes classmates, every boy was properly outfitted in a flannel shirt and jeans with a rope belt (a la Jethro Bodine), and every girl had an appropriate gingham skirt. Hairstyles included center-parts for boys and braids for girls, and each on-stage student was outfitted with a small slate-board and piece of chalk. In 1962, there was a production of Thorndike Barnhart, Jr. with my classmate Jim Molinari as a humanized version of the popular dictionary. The play had been written by the publisher and involved most of us dressed as a dictionary page, representing various words. We each came forward to announce, spell, and define our given word, then moved to the rear of the stage where we spelled out some popular phrase. This came with all the expected anxiety surrounding a few classmates who repeatedly stepped into the wrong places, thus creating an unclear message until the stage crew maneuvered them around. In sixth grade, we put on a re-enactment of the Last Supper. Apostles and servants wore old bed sheets (each dyed a bright color) to represent the fashion of the day. Those in charge of props were insistent that we use real matzos for historical authenticity, though the wine was nothing more than Welch’s grape juice served in cafeteria glasses. Nevertheless, the audience was treated to a well-rehearsed presentation—if you overlooked the one cast member whose sheet-costume contained a small daisy print pattern, having obviously come off her bed as a last-minute thought that very morning. By seventh and eighth grades, as someone whose voice had already changed, I was regularly cast as the narrator, commenting on the action, or reading the words of notables ranging from God to Abraham Lincoln to FDR to King Edward VIII. One widely advertised and well attended high school production was Young Hearts in Showtime—a joint venture presented at Washington High School in February 1965, featuring students from public and parochial high schools, plus Lafayette, St. Thomas the Apostle, and Presidio Junior High. Originally organized to honor Monsignor Stephen Barron on the occasion of his 50th anniversary in the priesthood, it became a neighborhood-wide celebration of youth talent. Many schools utilized the skills of current students as the nucleus of a talent show. In 1968, Lincoln High students performed to a clever theme of a child’s dream about a toy collection that came to life—thereby including roles for ballerinas, ethnic dancers, musicians of every type, including drum, trumpet, violin, accordion, as well as dancing bears, tricycle riders, and human building blocks. Lowell High School, with two theaters—the small, intimate Steve Silver and the larger capacity Carol Channing—has long promoted dramatic arts. One recent favorite has been Crazy for You, Lowell’s 2013 Spring Musical which has also been presented as a shorted version of the original on several occasions, much to the delight of audiences. Under the direction of Ken Barbieri from 1961-1977, Archbishop Riordan High School put on many spectacular shows, including Mame, The Unsinkable Molly Brown, Man of La Mancha, and a 1971 performance of Hello, Dolly! that played to packed houses night after night. Costumes and scenery were first class, as was the acting, with performers repeatedly attending the then-current Barbra Streisand film for technical pointers. Mercy High School on 19th Avenue also made a serious commitment to the performing arts when a new Fine Arts wing, adjacent to the original 1952 classroom building, became reality in 1972. At St. Ignatius High School in the 1960s, there was an annual Fall Play, plus an elaborate Spring Musical. Unlike the all-male casts of earlier days, by the 1960s, students from many Catholic girls’ high schools were invited to audition for female roles. In the words of one alum: “At the time, I thought they were generously donating their time…only years later did I realize they joined S.I. drama because they wanted to meet boys—I was pretty slow on the uptake back then.” Regardless of the play involved, most students referred to the preparations somewhat derisively as “play practice” while those involved instinctively snapped back “it’s REHEARSAL” in outraged tones befitting Cecil B. DeMille or Bette Davis. In my Stanyan Street days at St Ignatius the selections included classics: Our Town, Damn Yankees, Harvey, and the somewhat more adventuresome A Funny Thing Happened on the Way to the Forum. In 1968, there was Moliere’s The Would-Be Gentleman, an ambitious undertaking, while the 1969 Spring Musical was student-written—Come, Buy the World!! Sadly, there was no Fall Play in 1969, due to ongoing construction at the new 37th Avenue campus, but the 1970 Spring Musical—eventually performed in the larger-capacity University of San Francisco theater, owing to further construction delays—was the award-winning Broadway hit, How to Succeed in Business Without Really Trying, which played to packed houses. "How to Succeed" was considered modern and reflective of American business at the time, yet when it was revived as S.I.’s 2013 Spring Musical, it was widely regarded as a gentle parody of the past (fish on Fridays, mimeograph copies, secretarial pool, female office workers routinely living with their widowed mothers and hoping only for marriage). Some of the dialogue must have seemed positively archaic to current students. In the 1970s, St. Ignatius alum, Peter Devine, who had been involved in many performances as a student in the early 1960s, joined the faculty. 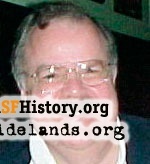 Directing 100 plays during his long career, he was commended by the City and County of San Francisco in 1987. One year later, he received another, even more cherished acknowledgment from hard-to-impress San Francisco Chronicle columnist Herb Caen, who saluted him for a near-professional rendering of My Fair Lady. At the time, Katie Wolf, St. Rose alum with a Fine Arts degree from Santa Clara and a Master’s from San Francisco Art Institute, had been an S.I. faculty member for over 10 years, and was also helping to raise the caliber of the school’s creative arts. She continues to do so today, some 37 years after being hired. 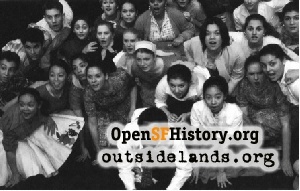 Without a doubt, though, my all-time favorite high school performance was A Farewell to Stanyan Street in May of 1969—incredibly, a full 45 years ago this month. The senior class, with the help of volunteers from St. Rose, Presentation, Star of the Sea, Mercy, and other girls’ schools, decided that a formal goodbye to the old campus was in order. On short notice, they resurrected several memorable scenes from old 1960s St. Ignatius performances—Arsenic and Old Lace, Charley’s Aunt, Margo & Me, Oklahoma, and others. Held in S.I.’s larger-capacity gym instead of the smaller auditorium, the audience enjoyed each vignette, and applauded politely. Then, as the lights went down following the final scene, the announcer spoke quietly about what was being left behind as the school readied itself to depart Stanyan Street after 40 years. He spoke of the once-bright future of a 1929 building, opened just weeks before the stock market crash that ushered in the Great Depression—and how that building was S.I.’s first permanent replacement for what had been lost in the Fire of 1906. He spoke of thousands of students, 14 to 18 years old, who called the place home over the past 40 years, as their parents often struggled to pay the tuition. Continuing in the darkness, the announcer spoke of World War II and the Korean War and the boys who never came home, plus the growth of the school, its academic and sports successes, and the post-war baby boom that brought all of us into the world. There were references to business and political leaders who once walked these halls before making a mark on humanity, and heartfelt references to some students who never reached graduation, including two of my own classmates killed in vehicle accidents, as well as a junior, whose sudden death during a basketball game in that very gym a few years earlier in December 1963 shook the entire community. The narrator recalled recent grads lost in Vietnam, a young police officer killed on duty in Golden Gate Park, and the ultimate tragedy of several bright young alums who had taken their own lives. Voice rising, he spoke of life’s challenges that lay ahead for all us, the contributions that each of us had already made to the school—including selling tens of thousands of candy bars and raffle tickets—plus St. Ignatius’ shining future at a new campus overlooking the vast Pacific Ocean. The lights came back up, slowly and dimly, revealing a swirling fog produced by blocks of dry ice dissolving in hidden buckets of water around the stage. A lone pale blue spot light was fixed on the embossed black-and-white painted steel street sign “Turk~Stanyan”—carefully and surreptitiously removed just a short time earlier from its official perch on the northeast corner of that intersection and set atop a sturdy pole at center stage. Surrounding the base and reaching up to the sign were a handful of students, wearing their senior jackets. They began singing the school’s fight song—softly and slowly at first—then growing louder and more resounding, as others began to join in, with the entire cast, crew, and audience standing and singing vigorously. There was thunderous applause from the audience, followed by darkness, as the lights went down for the final time on a Stanyan Street performance. Teenagers—then and now—would never admit to crying, but as the audience began shuffling out of that old gym, there were many moist eyes. Young and old alike—teens as well as parents—were all reflecting on their own lives and the lives of others, as well as on the unique mystery of life itself. So long ago, so far away. Page launched 1 May 2014.